curated by norman rosenthal and supported by: lisson gallery, gladstone gallery, fondazione prada, milan. 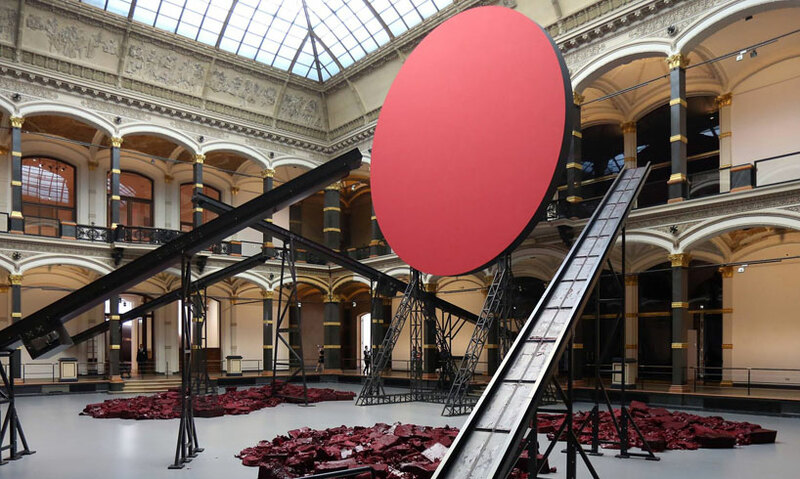 ‘symphony for a beloved sun’ can be found in the main atrium of the martin-gropius-bau museum— four conveyor belts protrude from the floor and walls and rise skywards, carrying red wax. as the wax moves up, it produces a squelching sound and when it is dumping on the linoleum floor in front of a giant red disk it makes a nice splat. the persevering viewer will find himself observing a perpetually changing wax object. because of its malleability wax lends itselfto designing spontaneous ideas for sculptures and has long been used in sculpture for modelling designs, making impressions, and casting moulds. 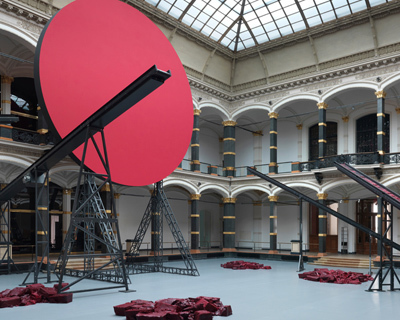 kapoor divests the material of its pallor and places it at the centre of his sculptural idea.‘symphony for a beloved sun’ is a homage to one of kapoor’s admired artists, joseph beuys, who exhibited ‘in zeitgeist’ in the atrium space after the building’s postwar restoration, in 1982. 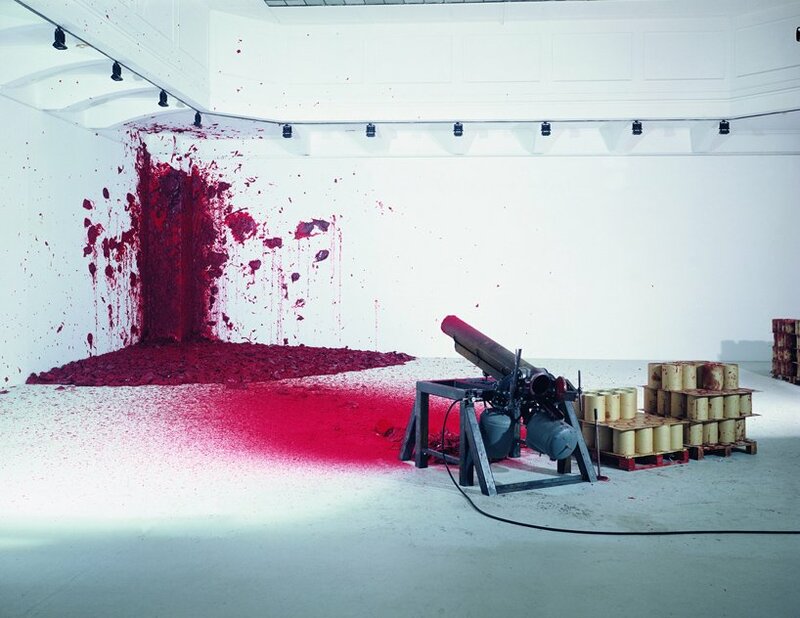 ‘shooting into the corner’ — a cannon fires round pellets of wax into the corner, staining the walls in a bloody red. 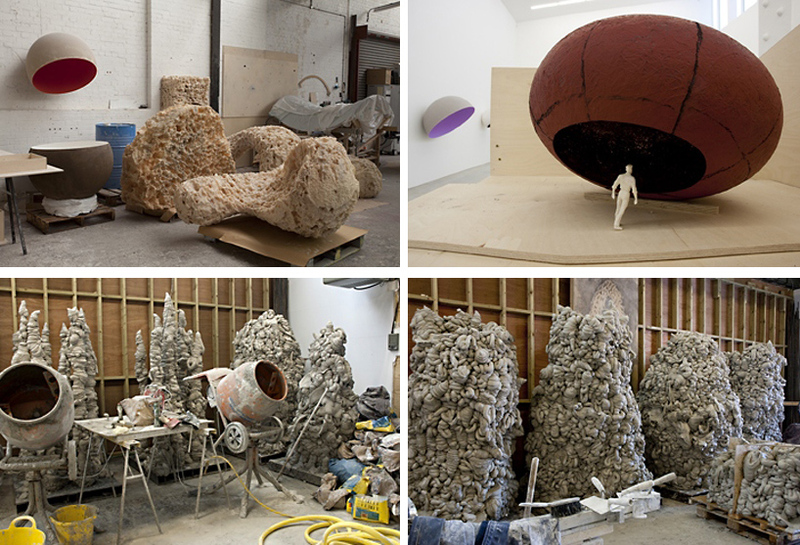 ‘kapoor conveys the inherent symbolic power of color as essence, material, and ready-made. 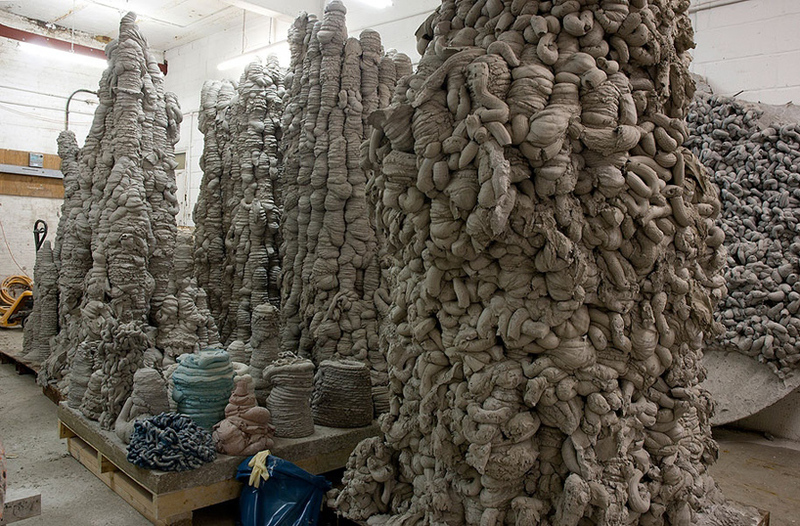 over the years he has imagined and realized an economy of means in countless ways, always with an under standing of the necessity to achieve form that expresses the material’sessence. this says much about his ability to communicate using, in a fundamentally abstract language, these three elements: color, form, and material. with these means he achieves a wide range of sometimes self-evident, but also personal, hidden, and secret meanings. 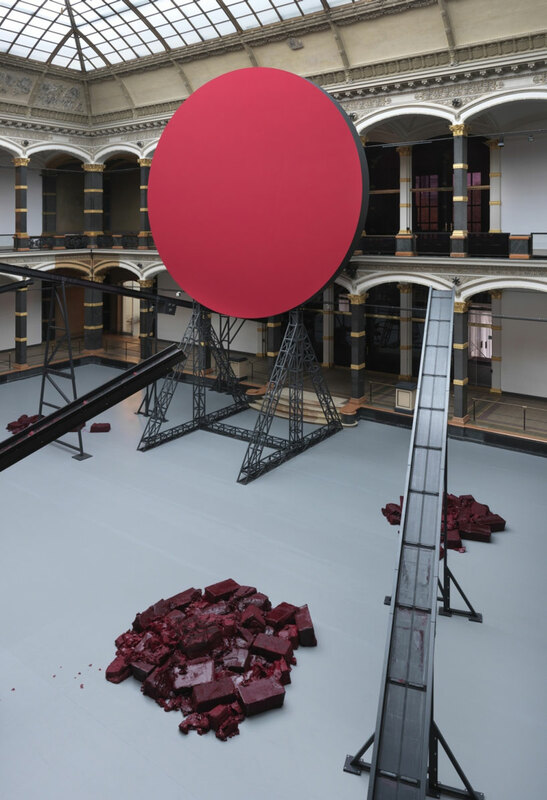 it is the purpose of this essay to offer clues and connections to a body of work built up over a period of more than three decades, an endlessly inventive ‘theater of sculpture’ of which this exhibition, kapoor in berlin, is a highly significant stage. 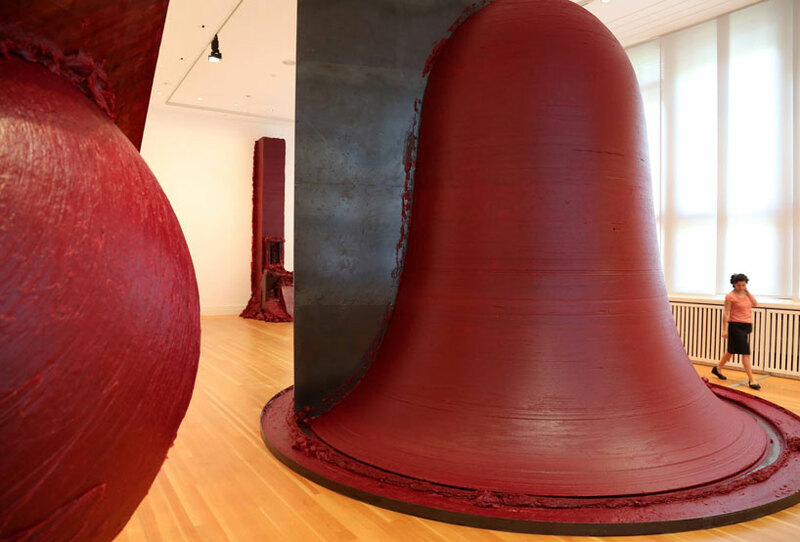 kapoor’s art encompasses the aesthetics of shock and surprise, but equally that of the sublime and the quiet. it also exemplifies specific dualities: the pure and the messy; the smooth and the rough; the void and the dense; the tranquil and the noisy; the implicitly sexual and the chaste. often these dualities are present within a single work. 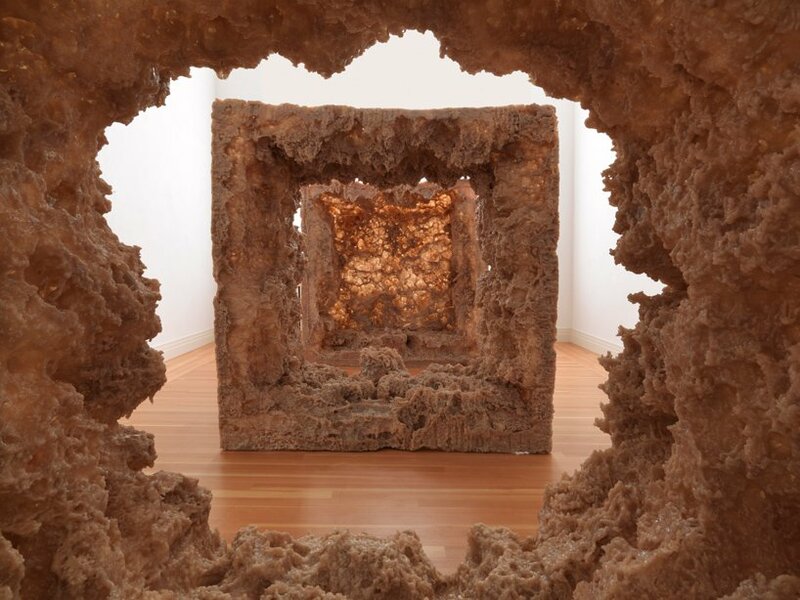 moving through a large exhibition such as this we find the artist inventing spectacular pieces onto which we are forced to project and reflect,drawing on our experience and imagination to interpret the essential forms and colors.’says the curator of the exhibition, norman rosenthal. 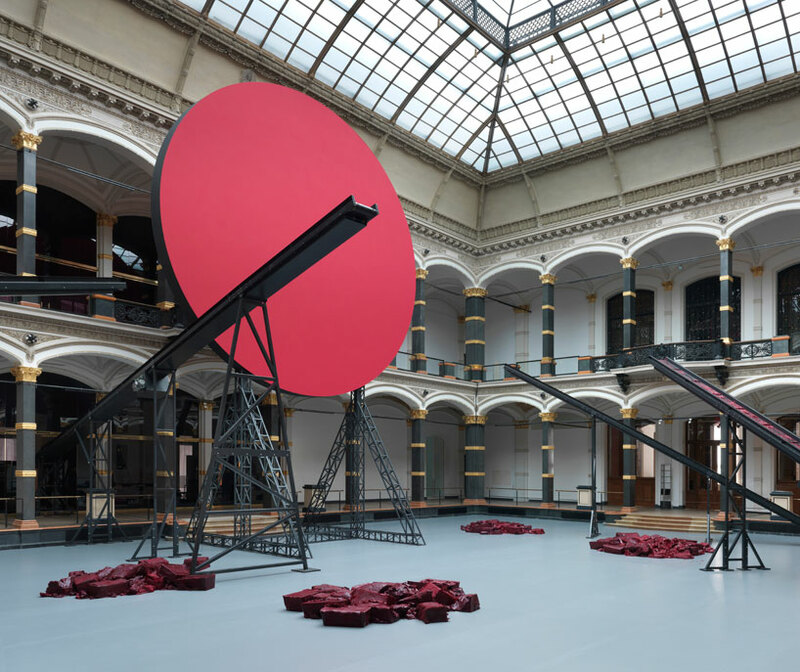 gleaming high-grade steel mirrors causes the natural order of time and space to fall apart, and the viewer is left to fend for himself.and there are lots of mirrors: convex, concave, twisting and a painted mirror in a deep dark red – a blood-like shade that emphasizes the organic element. 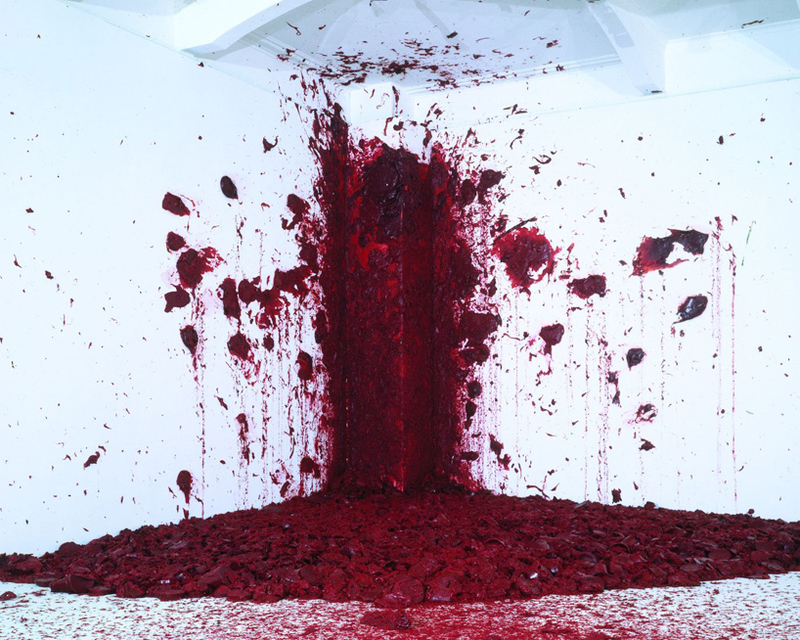 the artist said it has ‘a visceral reality‘. ‘all cultures have seen the essence, even the keys, of creation itself reflected back in the mirror. in the newtonian scientific age that has ruled our sense of logic, in which everything is inherently explicable, explanations nonetheless do not take away from a sense of surprise when confronting reflection effects in mirrors.in the reflection of the brightly polished surfaces the viewer sees a distorted vision of himself and the room.’says norman rosenthal. ‘death of a leviathan’ — a deflated PVC whale sags its way across three rooms.it continues there where kapoor left off with ‘leviathan’, a gigantic balloon that filled paris’ grand palais in 2011.designboom met with the artist to discuss the ideas behind the immersive work and document the installation,which you may view here. the artwork leaves this dialectic behind. the huge animal lying on the ground corresponds with the idea that the state has lost its justification for existence since the 1990s because, in the face of the dissolution of the iron curtain between the blocs and the fact that just one form of economics enables global networking and connection, people could now associate freely. they dictate the laws to the state, and not the reverse: this was the doctrine considered valid until 2008, when the horrendous consequences of the receding of the state became obvious.it makes the prediction that the future of society free of the state, whether hoped for or lamented, has already begun. that the condition of a failed state in no way means a liberated anarchy, but rather terror and the abuse of power, becomes clear in the face of the pitiable horror of this dying sculpture. extract of essay by horst bredekamp ‘the death of leviathan: form as a political issue’. 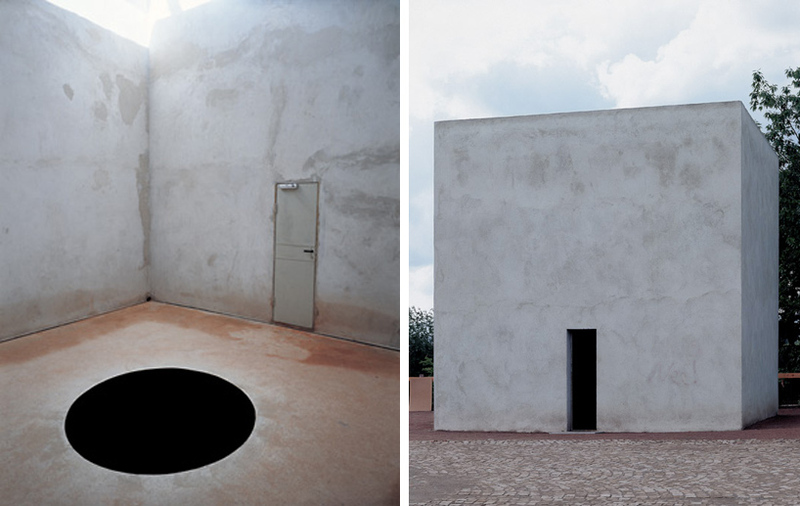 in anish kapoor’s universe there are many black holes. 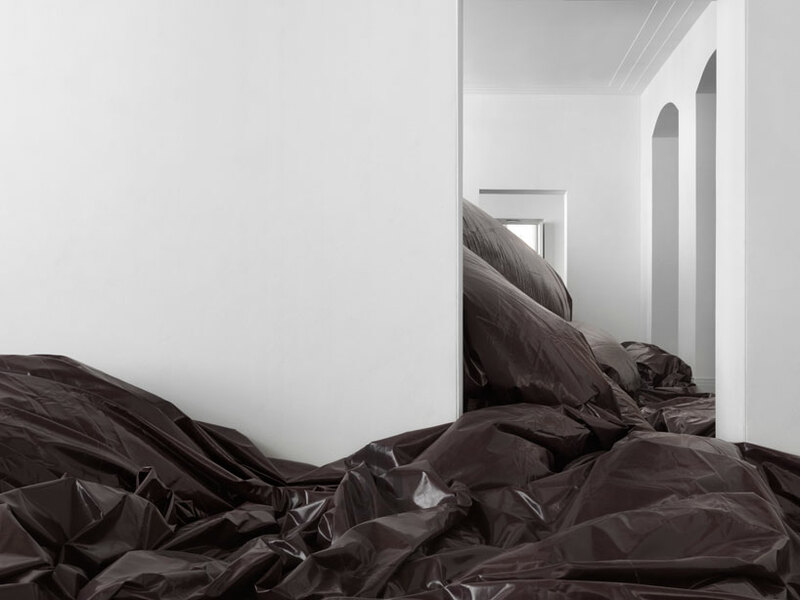 one of the highlights of documenta IX was kapoor’s room ‘descent into limbo’, in the middle of a walk-in cube a seemingly bottomless black hole opened up in the floor and literally dragged the viewer into itself. 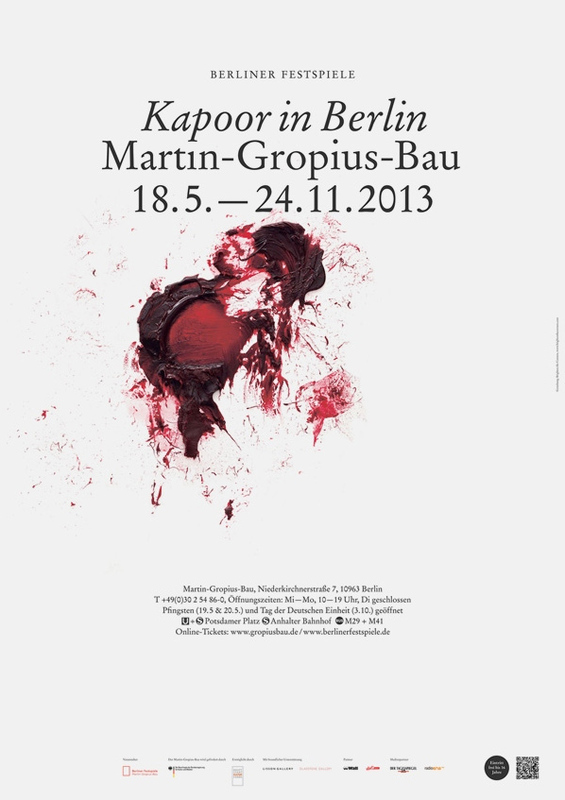 a new version of this work is in the martin-gropius-bau show. Superbe ~ The larden of Eden !